My darling Christmas day's treat - Turkey Liver & Gizzard Veg Stew. We had good food on X'mas and my darlings too. 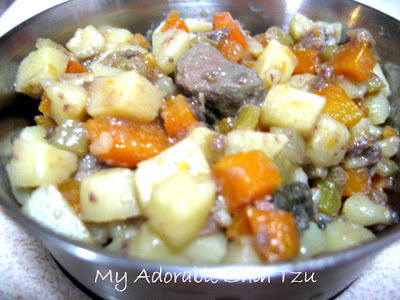 I specially made this stew for them on Christmas Day. They really love it. 1. Heat oil & fry garlic till fragrant. 2. Add all ingredient & water and simmer till carrot and potatoes are soft. 3. Serve when it's cool down.